Home / Digital Camera Comparison / Canon EOS 70D vs 7D vs 7D Mark II, what’s the difference? If we had to choose a newly released camera that had the best new features, our favorite would probably be the Canon EOS 7D Mark II. Regardless of whether the camera is a stroke of genius or a failure, Canon has the largest customer base and many customers have been pining for a new APS-C-Flagship. There is hardly a contest: The EOS 7D Mark II is the leader. The new autofocus featuring 65 sensors arranged in crosshairs is alone impressive. Naturally, we will go into more detail, but we must mention that our table only includes the most important information. Of course there are many more small differences, video functions for instance. Those are out of scope for this discussion though. Five years has passed since the 7D was released, and of course much has been done in these five years: The sensor in the 7D Mark II is new, it has a new processor, and the low-light performance is better, the ISO-range is greater. Also, as previously mentioned the autofocus is new. For those not currently satisfied with their 7D – yes, an upgrade is worth it. However, for those customers currently satisfied with their 7D, the reason to upgrade is not so compelling. This is true for pretty much any camera. On the other side: 5 years of development – that’s a lot of work! Could we have expected a little more from the new device? Take battery life for instance. Why can a user only take 130 photos at a time? The display is also very similar to the 7D. Upon close inspection it is a little brighter and a little snappier, but at its core very little has changed. The same goes for the video resolution, although we were surprised in 2009 that users could shoot full HD with 30p. Let’s just say that the next version will take another five years, then the resolution will not change for a period of 9-10 years. That is not to say that we actually need higher resolution, but the example just goes to show how long development in certain areas takes. Another good example of that is the continuous mode speed: 2 fps is certainly as valuable as gold in certain situations and 10 fps is, in comparison to the current competition, not bad. But really – we can’t ask for anything in 5 years? 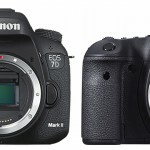 The comparison between the 7D Mark II and 70D is interesting. A review of the specs quickly shows that the 70D has some advantages over the 7D Mark II. Namely, it has a touchscreen, a display that pivots and WiFi. Also, it is somewhat smaller and has a real advantage in battery life. Furthermore, the image quality is not noticeably worse than the 7D Mark II because the sensors are essentially identical. Of course other factors play a role in image quality (processor, light sensors, etc) and 7D Mark II understandably delivers better photos than the 70D, but the difference is allegedly not that huge. Of course, test images speak louder than words in that discussion. Is it worth it to save the 800 dollars (the EOS 70D is available for 999 dollars) and not buy the 7D Mark II? Hard to say. If the aforementioned features (touchscreen, WiFi, etc) are important to the buyer, then yes. And those 800 dollars could be put to good use elsewhere. If we round a little bit, the 7D Mark II is basically double the cost of the 70D. This means the 7D Mark II is not right for most hobbyists, but makes more sense for professionals. More about 70D vs 7D, please read this article: Canon EOS 70D vs 7D Comparison, What’s the difference between them? Finally, the question must be answered: is it still worth it today to buy an old 7D? We don’t think so. The 7D still costs around 1000 dollars and is therefore not more economical than the 70D, which has many advantages. What do you think of the comparison of these 3 cameras and what experiences do you have with the 7D and 70D? Previous Sony A7 II, the first Full Frame camera with stabilizer on the body. Next Is Sigma planning to launch lenses for Fujifilm’s X Series?